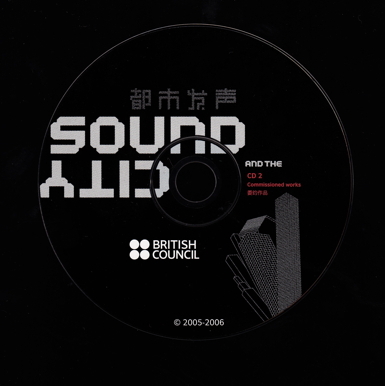 Sound And The City was an innovative sound art project, conceived by the British Council and realised across China between 2005-6. 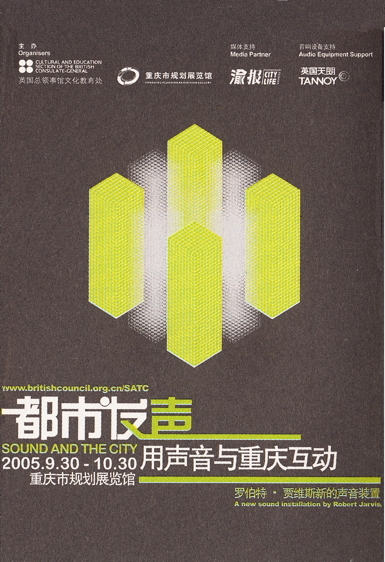 A result was the Sound And The City anthology, officially launched in London at the Royal Festival Hall on Monday, April 21, 2008. 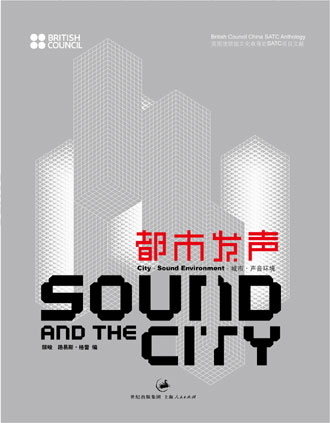 Seven leading UK sound artists - Brian Eno, David Toop, Peter Cusack, Clive Bell, Scanner, Kaffe Matthews and Robert Jarvis - were invited to create new work inspired by the civic sound environments that they found in four cities - Beijing, Shanghai, Chongqing, and Guangzhou. 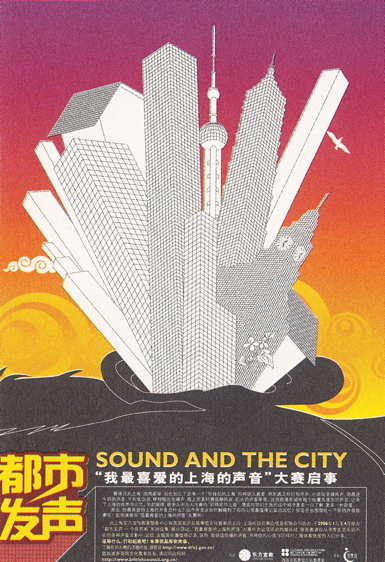 The artists' experiences are documented in this book, along with essay contributions from UK and Chinese critics. 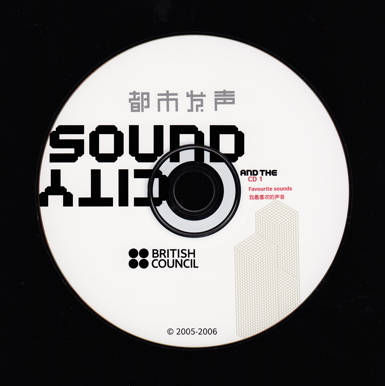 The project also invited the Chinese general public to describe their favourite sounds of the cities that they live in. Those descriptions, along with audio recordings, are contained within the book and its two accompanying CDs. Many of those favourite sounds are ambient ones, less and less frequently heard as Chinese society changes at its current ferocious pace. 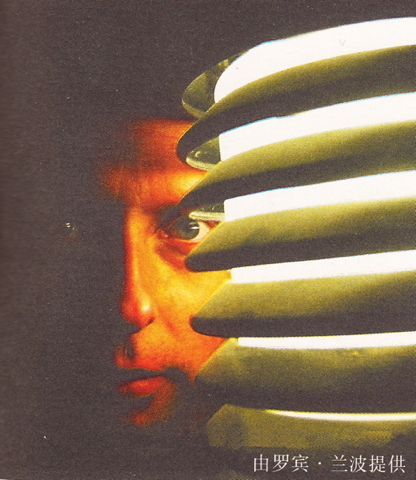 Brian Eno: I came to Beijing in March . It was my first trip to China and it was a completely new experience. For me, one of the most interesting aspects is the relationship between the seniors in China and the Chinese society, because I'm hardly young myself now. One day I went to the Temple Of Heaven, and I saw something which may seem trivial to locals, but was totally incredible and beautiful for me. In my country, people always treat seniors in a go-and-take-some-sleep-and-leave-us-alone way. In Britain, there are places with tiny rooms, in which people put their little grandpas and grandmas in. Those rooms were built to let the seniors die inside. The population of Britain is about fifty-five million, and there are about one or two million who are elderly. Those people have nothing else to do but watch television. You can imagine what it's like to watch daytime TV everyday for the last twenty years of your life. What moved me is that, when I first came to Beijing, I went to the parks and saw a lot of seniors doing all kinds of things. They were all very happy and laughing. And it's not only in the park that I went to: every park is like this. You almost never see such things in Britain, and I believe it doesn't happen in the whole Europe, either. So I thought, here is my real audience. There is way too much music for the young; I want to create something for these people. Of course, this is kind of a joke. Brits are joking non-stop all the time, so sometimes it's a bit hard to tell whether we're joking or not. David Toop: Why should the passing sound of a city be important? If we possess eyesight and touch, then why should we even trouble to give any significant attention to a sense impression that is just the side effect of city life, movement, and human communication? Surely if we listen to words addressed directly to us, to favourite music, a knock on the door or the ringing of a phone, to danger sounds such as that bus coming too close, or a child in distress, then all other environmental noise can be ignored or shut out. This has been the big question for more than thirty years now for those musicians, sound artists, audio recordists and sonic researchers who try to listen at a deeper level in order to understand how sound functions in human society. To think consciously about sound seems to be fairly unusual, yet ask anybody about sound, or listen carefully to the way in which people behave, and then it becomes clear: sound functions as a cohesive force in society; it activates spaces and events, lives in memory long beyond its own duration, and forms an essential part of a person's inner life of emotions, thoughts and consciousness of the world. Very few people can tolerate complete silence for long: a frightening emptiness opens out to infinity; faced with this pressure of nothingness, the inner dialogue of the mind threatens to run out of control. Perhaps this fear of total silence is based on its rarity. At night, if I cover windows with thick curtains, shut the door and close my eyes, then I experience absolute darkness, yet sound is still present: the faint noises of my own movements, whistling in the ears, voices in my head, cars passing by outside. Even the air in a room can seem to have a sound, simply because there are many variable echoes within normal spaces and these echoes give a particular character to the way in which we hear even the faintest sonic disturbance. Sound has no edges, no boundaries, so sounds mix together in accidental proportions. We become accustomed to separating out the important information in those common situations when speech, music and the ambient sounds of the environment are flowing all around us, coming and going in every direction and blending in ways that are not always pleasing or ideal. 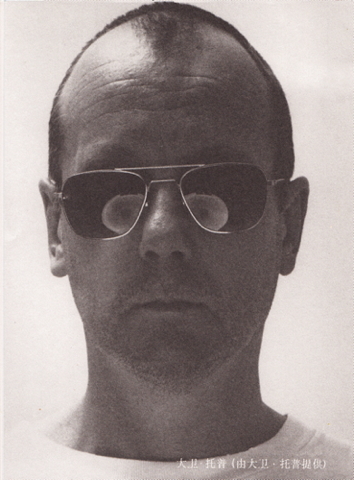 Robin Rimbaud AKA Scanner: The hum of a city is seemingly inescapable, that unnatural hovering electrical fog that invades every space, and as if in defeat, all we can do is mask it, neutralising it through the use of televisions, radios, CD players, at battle with a force seemingly beyond us. The Asia region is recognised for its extreme noise levels, indeed apparently more than thirty percent of people are exposed at night to noise that seriously damages their sleep, but is there something in here that we can learn about the city, its sound, its people and how this pollutant can be engaged with as a positive factor? The Sound And The City initiative of the British Council - a search for music in the sound of the streets instead of that of the concert hall - was a positive step in a creative way with which to reconsider our cities, our relationships to them and how noise can equally operate as an affirmative dynamic. I was offered the chance of creating a work in Gangzhou, a port on the River Pearl, with a population of around thirteen million, making it the most populous city in the province and the fifth most populous in China. Through trade and industry it has earned a series of nicknames: Wuyangcheng ('City Of Five Rams'); Yangcheng ('City Of Rams'); Huacheng ('City Of Flowers'); or Suicheng ('City Of Wheat'). It was the penultimate name here that was to offer the inspiration for my project.